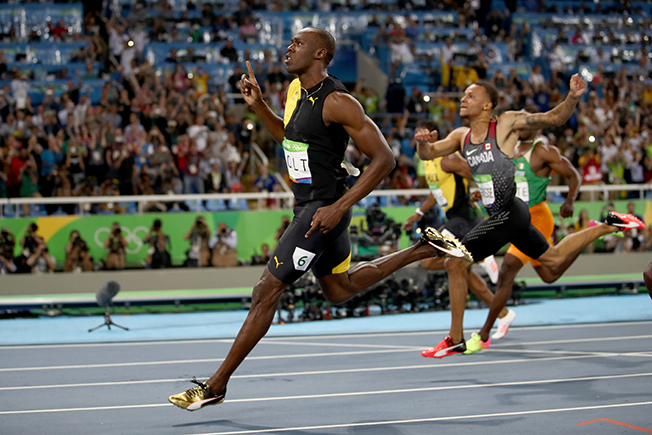 NBC's Sunday night Olympics coverage focused on Usain Bolt, and the iconic Jamaican sprinter delivered. Bolt achieved a historic feat by edging American Justin Gatlin for his third consecutive Olympic gold medal in the 100-meter competition. He won the race in 9.81 seconds, a number apparently not up to his standards, with Bolt later remarking to the press: "I expected to go faster, but I'm happy that I won. I did what I had to." Simone Biles scored another gold medal last night, winning the vault competition and in the process becoming the first U.S. gymnast to win three gold medals in one Summer Olympics. NBC Olympics ratings results from Sunday night were mixed, per Nielsen data. The NBC-only average total prime-time viewership was 26.7 million, down 15 percent from the same Sunday at London 2012 (31.3 million). The Total Audience Delivery (TAD) average from last night is 28.1 million, still down 10 percent from the same Sunday at London 2012. Last night's prime time telecast also delivered a 15.8 household rating, down 11 percent from London 2012 (17.8). Per TAD data, NBC is averaging 29.2 million total prime-time viewers over the first 10 nights of Rio 2016. That is down 12 percent from the first 10 nights of London 2012 (33.1 million), and down 3 percent from the first 10 nights of Beijing 2008 (29.8 million). Also in prime time on Sunday, NBCSN's live Olympic competition coverage averaged 1.02 million viewers, while Bravo's live coverage of Andy Murray's victory in the men's tennis gold medal match (7-8:30 p.m.) averaged 929,000 viewers. Top local markets for NBC Olympics Sunday night: Salt Lake City (20.5); Austin, Texas (20.2); Columbus, Ohio (19.9); Richmond, Va., (19.9) and Denver (19.7). NBC Olympics on Sunday reached 1.86 billion livestreaming minutes–already topping by 26 percent combined total of all prior Olympics (1.48 billion). Sunday managed to outperform Friday and Saturday, but was down from Thursday. On Saturday, the network delivered 25.5 million total prime-time viewers and a 14.2 household rating. With the help of TAD data, the games delivered 26.8 million total prime-time viewers and a 15.0 household rating.